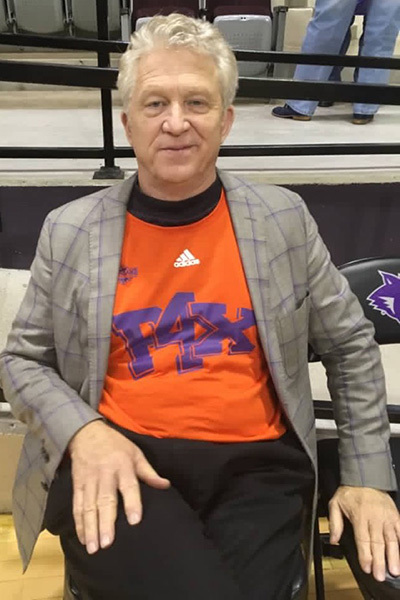 Northwestern State University head basketball coach Mike McConathy sports his P4X shirt. For two-and-a-half hours on a recent Saturday, Mike McConathy was the worst dressed man in college basketball. The men’s head coach of Northwestern State University had arrived at Moody Coliseum decked out smartly in a gray sport coat with crossing purple stripes, black slacks and a dark mock turtleneck. But just before his team tipped off against Abilene Christian University, McConathy slipped on a bright orange, long-sleeve, moisture-wicking athletic shirt. The front of the shirt bore three prominent characters that convinced McConathy, quite the character himself in his 18th year leading the Demons, to commit such a fashion faux pas: P4X, the name of the foundation benefiting from funds raised during that doubleheader between ACU and Northwestern State. P4X originated as the rallying cry for Rex Fleming: Pray 4 Rex. The son of ACU associate director of athletics for media relations Lance Fleming (’92) and his wife, Jill, Rex was diagnosed with a cancerous brain tumor in November 2010. 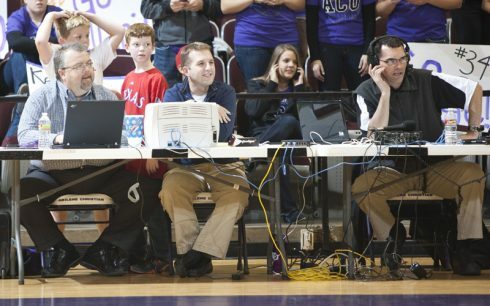 His two-year battle engaged innumerable supporters from among the extended ACU community, the city of Abilene, various corners of college athletics and the worldwide web via social media. When Rex passed in November 2012, the Flemings wanted to find a way to assist and comfort families fighting pediatric cancer in the same way they had been blessed. So in 2013, they established the P4X Foundation, tweaking the acronym from pray for Rex to play for Rex. 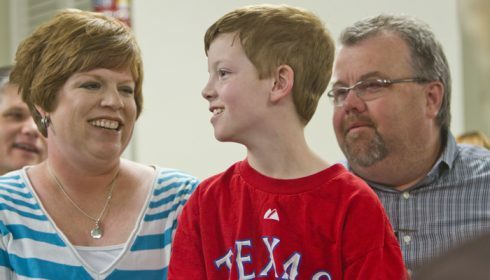 Through a series of promotional events over the last four years, the P4X Foundation has raised more than $200,000 and partnered with healthcare organizations where Rex was treated, such as Hendrick Hospice Care and West Texas Rehabilitation Center, to create spaces where families can congregate, regroup and find strength. The foundation also has made numerous gifts to individual families at places like Cook Children’s Medical Center in Fort Worth. The idea to designate that aforementioned Saturday, Feb. 11, as P4X Day at Moody was hatched in January and came together quickly. It began with a conversation between Lance Fleming and ACU associate men’s basketball coach Brette Tanner, who volunteered to reach out to the Northwestern State coaching staff, many of whom he has known from his years as an assistant at Stephen F. Austin State University. Even though ACU’s athletics department moved forward with plans to recognize the P4X Foundation that day, NSU as the visiting institution had no obligation to participate. Not only did both McConathy and his women’s basketball counterpart Jordan Dupuy verbally agree to be part of the program, they each put their money where their mouths were. Each NSU team enthusiastically accepting the invitation to wear specially made warm-up shirts with their team colors (orange with purple lettering) similar to the purple and white versions ACU players would wear. And despite the fact that neither coach has a personal connection to ACU – in fact, Dupuy is in his first season with the Lady Demons and was making his first trip here – both sought out Fleming courtside and wrote a personal check to the foundation. McConathy, his eyes glistening while listening to Fleming speak of Rex and living to tell his story, even told NSU sports information director Doug Ireland and the Demons’ radio announcer Patrick Netherton they need to get a team together for the P4X Foundation golf tournament in Abilene on May 15. Don’t bet against it. 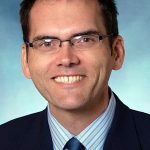 This is the same coach who drove to Huntsville, Texas, to attend the visitation services of a woman he’d never met: the wife of Kooter Roberson, veteran play-by-play man for NSU rival Sam Houston State University. In his explanation that faith and good deeds go hand in hand, James, the brother of Jesus, wrote, “Even the demons believe.” It’s true. I watched it happen. Rex was a familiar face at ACU sporting events his whole life, here standing behind (from left) his dad, Lance, Chris Macaluso and Grant Boone.